The 'unsinkable' ship defied odds and expectations, leaving a legacy of disaster that lives on to this day. “TITANIC” DISASTER, 1912. — No single event in 1912 could compare, in the intensity of its universal appeal to human emotion, with the awful disaster to the British steamship “Titanic.” At 2:20 A.M. on April 15, that great White Star liner, the largest afloat, on her maiden voyage, went to the bottom of the Atlantic in lat. 41º 46' N., long. 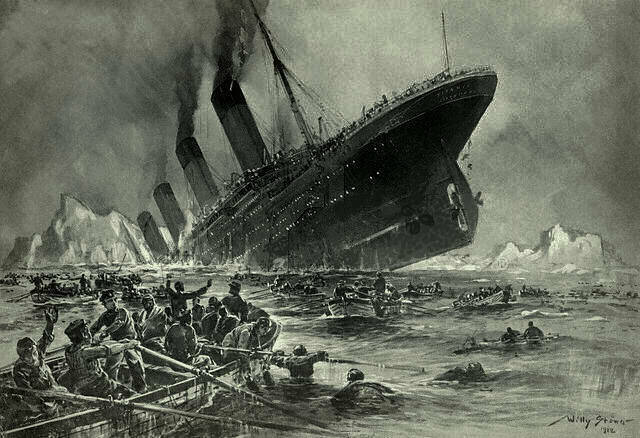 50º 14' W., about 2¾ h. after striking at full speed on an iceberg, with a loss of 1,513 souls out of 2,224 on board. It had been supposed that such a vessel was unsinkable, and the tragedy raised numerous questions as to methods of ship construction, and additional provision of life-saving equipment. The “Titanic” had nominally boat accommodation for double the number saved, and the 20 boats launched were meant to hold 1,178 persons instead of the 652 they actually contained when they left the ship; moreover, the disaster occurred under exceptional conditions for getting people safely off, in the way of smooth water and fine weather. The most salutary lessons seemed to lie in the following directions: first, improved design and construction so as to provide a really unsinkable ship; secondly, greater precautions in navigation and look-out — for the “Titanic” was going at 18 knots (according to Lord Mersey an “excessive speed”), though it was known that icebergs were exceptionally numerous on the course; thirdly, better and more regular organization on shipboard — by boat drill (there had been none on the “Titanic”) and otherwise, for the emergency of having to abandon ship; and fourthly, a compulsory service of wireless on all liners, working day and night for it was one of the most lamentable incidents in the whole terrible story that the “Titanic's” wireless call for help, picked up all over the ocean and nobly responded to by the “Carpathia,” (Capt. Rostron), 70 m. off, fell on deaf ears on the “Californian” only 8 or 10 m. away. The full record of the disaster is contained in the reports of the inquiries held at once in America by a committee of Congress under Senator Smith, and later in London by a special commission presided over by Lord Mersey (report issued July 30). Painful and difficult though it was to distribute blame in such a case, there could be little doubt that the loss of life — 817 passengers out of 1,316, and 696 out of a crew of 908 — was much greater than ought to have been possible. Capt. E. J. Smith (b. 1853), a highly experienced seaman, who had been for 38 years in the service of the White Star Co. and who now went down with his ship, seems to have been averse from taking steps at first which might cause a panic on board; otherwise there should have been time, if adequate means of organization and of commanding discipline had existed, not only to get more people into the boats but to improvise rafts. In naval circles the opinion was strongly held that this should have been done, since the injuries received by the ship made it certain that she would sink in a given time. The figures of the 711 saved by the “Carpathia” (including about 60 who were picked up in the boats after the ship went down) speak for themselves: — Women: first class, 140 out of 144; second class, 80 out of 93; third class, 76 out of 165; crew, 20 out of 23. Children: first class, 6 out of 6; second class, 24 out of 24; third class, 27 out of 79. Men: first class, 57 out of 175; second class, 14 out of 168; third class, 75 out of 462; crew 192 out of 885. Altogether the percentage of women saved was 74.35, of children 52.29, of men 20.27. The comparatively small proportion of third-class passengers saved was shown to be purely accidental and not due to any preference being deliberately given to others; they were handicapped, however, by their quarters being remote from the boat deck, and by so many of them being unable to speak or understand English. Jump up↑ The exact figures remained doubtful, but those given are from Lord Mersey's report. Jump up↑ Apart from the “Californian's” wireless operator having gone to bed, however, Lord Mersey was satisfied that if her captain had realized the situation properly she could have saved “many, if not all, of the lives that were lost”; for evidence showed that distress rockets sent up on the “Titanic” were actually seen from the “Californian,” though no action was taken in response to them. The incredibility of such a disaster appears, in that case, to have paralysed the capacity for interference.